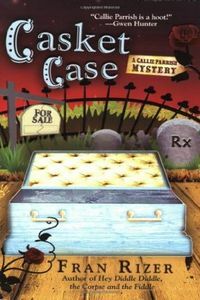 Casket Case by Fran Rizer, a Mysterious Review. Review: Callie Parrish investigates the accidental death … or was it murder? … of a lifelong friend in Casket Case, the third mystery in this series by Fran Rizer. When retired pharmacist Melvin Dawkins is found dead, floating face down in the Jacuzzi he had just had built for his young bride, Callie's brain begins to ponder the possibilities. He was elderly but in good health. Is it a coincidence that he suddenly dies soon after marrying a much younger woman? Coincidentally, another May/December couple are prominently on display in the city. A very wealthy elderly lady is introducing her very young fiancé to one and all. She has put her real estate holdings on the market so she can leave and move to Florida with her paramour to live happily ever after. Trouble arrives when someone wanting to buy a property gets argumentative and insistent that the renter of one of apartments move out that day. The renter is Jane, Callie's best friend. The malevolent woman is later found dead at the foot of the apartment steps the next morning. Did she fall? Was she pushed? Although Callie is not directly involved with either death, she is chased and run down, nearly killed in her car by a person unknown. When she returns home from the hospital, she finds her rooms in shambles and a cryptic warning written on her mirror. Sure, Callie is a common link to both deaths, but what does she know? Could these incidents all be related? Callie ("Calamine" to her father) is an engaging amateur sleuth in an unusual profession. She's secretary, receptionist and cosmetologist at Middleton's Mortuary. But she has an annoying habit of stretching words like "please" into multiple syllables, and her use of Steve Martin-esque "excuse me" seems hopelessly dated. Still, the book is completely void of four-letter words, something many readers will be grateful for and other authors would do well to emulate. (The use of kindergarten swearing, though, is kind of cute.) The story is pleasantly amusing and on the whole, Casket Case is a nice way to while away that long, lazy weekend afternoon. Special thanks to guest reviewer Betty of The Betz Review for contributing her review of Casket Case. Acknowledgment: Penguin Group provided a copy of Casket Case for this review.